For bmw, which had just lost its main car plant to the eastern bloc as a result of the post-world war ii partition of germany, plans to get back into car production took a long time to come to fruition. It wasnt until 1952 that the 501 a limited-production six-cylinder model of basically prewar design saw the light of day. Top speed of 137 mph (est.) engine typedrivetrain: Water-cooled, overhead-valve v8 displacement 3,168 cc (3.17 l) power output 150 hp transmission 4-speed manual chassis: Pressed-steel; Independent front suspension by upper and lower wishbones with torsion bars; Rear suspension by live axle and torsion bars; 4-wheel drum brakes (front disc brakes by 1958); 2,684 lbs. Early versions a v8 engine was on the test bench as early as 1949, but the first v8 bmw the 2.6-litre 502 did not appear until 1954. The marques austrian-born agent in the United States, max hoffman, wanted a sports model added to his line and convinced the bmw board of directors in munich that there was a market for such a car in america. The bmw design department began work at once. enter the 507 eighteen months later, they presented to the board not one but two 3.2-litre, v8 sports cars the 503 and the 507. Both cars had been designed by albert goertz. Launched at the 1955 frankfurt show, the 507 was not put into production until november of 1956. Its late entry into the american market and the high cost of production prevented it from enjoying the success that had been anticipated. 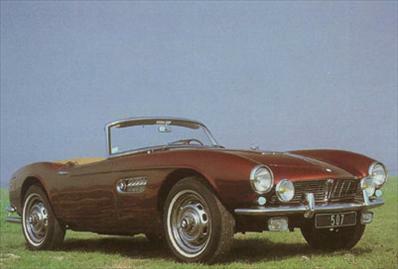 Designed primarily for export, the bmw 507 roadster was one of the most powerful of the munich firms limited-production v8 sports cars of the fifties.